Faculty Scriptorium (faculty meeting together in silence to wri te scholarly stuff) begins again today in the Mortara Center. Please send a note if you’d like to attend, and I’ll give you the wheres and the whens. This grew out of a desire for protected time to write during the semester where we could still be together and enjoy the collegiality and accountability. It’s amazing how much less multi-tasking goes on when a colleague is present! I don’t even look at e-mail during the two hours. The Scriptorium writers will meet in the street-level, large conference room of the Mortara Center today, Tuesday, September 7. We’re usually in a smaller room, but it happens to be available and other space is booked. I will be there with laptop and books from 9:30 – 11:30, writing. Faculty authors are welcomed to join me. For those who are new to the concept, Scriptorium (loosely translated as “a place for writing,” although it has other more specific historical meanings) is a way of getting together to sit quietly and write. It serves several purposes, including adding a layer of collegiality and accountability, getting us out of our usual spaces for writing, and allowing a quiet realm where others won’t tap on the door and the phone won’t ring. We tend to focus more and multitask less when we’re together, and we are more likely to keep to a two-hour-per-day schedule when other people are expecting us there. Scriptorium is drop-in, so there is no need to sign up, but I look forward to seeing you if you want to come. Enter quietly, set up your laptop and get going. We don’t do greetings (the occasional whispered hi, but keep it to a minimum), and there’s no need to make a big announcement if you have to leave, just pack up and wave. I hope to see some of you there! As the semester develops and we get a more regular Scriptorium schedule, I will post it. This morning was a-ma-zing. I have learned slowly what others have said over the years, that cutting an article can make it sound much more coherent, since readers don’t know what you didn’t say! Just going through and weeding out the interesting starts I had that went nowhere tightened the paper up to a manageable 11,000 words. Although I was sad to lose those ideas (some of them could have led somewhere), an article can’t do everything and I could have spent months tracking them down. Writing with E. in Scriptorium this morning was inspiring, and I’m looking forward to five big Scriptorium days next week. 9:30-noon, all week long. We’re back in the Pierce Room for Scriptorium today, a half-hour shorter because of the 11 a.m. Monday faculty scholarly publishing group. On Friday, July 2, I will hold the 9-11 Scriptorium session at Lauinger Library, but NOT the 2-4 session. Hooray! Booklab’s Scriptorium group is a hit. Lauinger Library’s Pierce room seems like a fine spot, so we’ll meet there again on Friday, June 25. A map is here. Bring your computer or your paper, enter quietly, and join me for either or both of two Friday sessions, one from 9-11 a.m., and a second session from 2-4 p.m.
Booklab’s Scriptorium group will meet again in Lauinger Library on the entry-level floor in the Pierce Reading Room, to the right of the circulation desk as you walk in. The entry floor in Lauinger is actually Floor 3, and a map is here. Bring your computer or your paper, enter quietly, and join me in focused time from 9:40-11 a.m. (40 minutes later than yesterday). Scriptorium is drop-in and casual. I hope to see some Booklab faculty authors there! Yesterday I posted about the summer Scriptorium experiment, where Georgetown faculty are invited to meet me in different places on campus to write quietly during the day. This is Day 1, and I will be in Lauinger Library on the entry-level floor in the Pierce Reading Room, to the right of the circulation desk as you walk in. The entry floor in Lauinger is actually Floor 3, and a map is here. Bring your computer or your paper, enter quietly, and join me in focused time from 9-11 a.m. It is fine if you come late or leave early as long as you’re quiet about it (a friendly wave or smile is fine). Booklab Scriptorium experiment — come write with us! Today is the first day of summer, and the first announcement of the Booklab Scriptorium experiment, where I post daily a new spot on Georgetown’s campus for colleagues to gather and write. Scriptorium is drop-in and casual — it will move around as the spirit moves, and it will happen most days, but only when I have a block of time (two hours is usually about right) to go somewhere and invite fellow authors to join me. You can invite Scriptorium to your department! You can join us when you need a break from solo toil! (1) Enter silently. Even a round of “hello” to several people can be jolting, so simply nod to colleagues if you wish, open your laptop or settle in with paper and begin. (2) Ask me softly for the focus assignment if you want it. This will be a written exercise to get you started if you’re having trouble quieting your mind and working. Although we will observe general quiet, it’s okay to ask me for this when you come in. 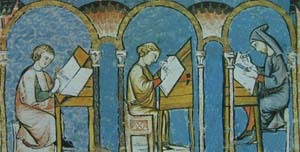 (4) Scriptorium begins Tuesday, June 22. The location posts will be up by 8 a.m.
All are welcome with love and gratitude. Booklab focuses on tenure-line faculty, but others including adjuncts, staff, Woodstock fellows, etc. may also join us at Scriptorium.